New observations made with APEX and other telescopes reveal that the star that European astronomers saw appear in the sky in 1670 was not a nova, but a much rarer, violent breed of stellar collision. It was spectacular enough to be easily seen with the naked eye during its first outburst, but the traces it left were so faint that very careful analysis using submillimetre telescopes was needed before the mystery could finally be unravelled more than 340 years later. The results appear online in the journal Nature on 23 March 2015. Some of seventeenth century's greatest astronomers, including Hevelius—the father of lunar cartography—and Cassini, carefully documented the appearance of a new star in the skies in 1670. 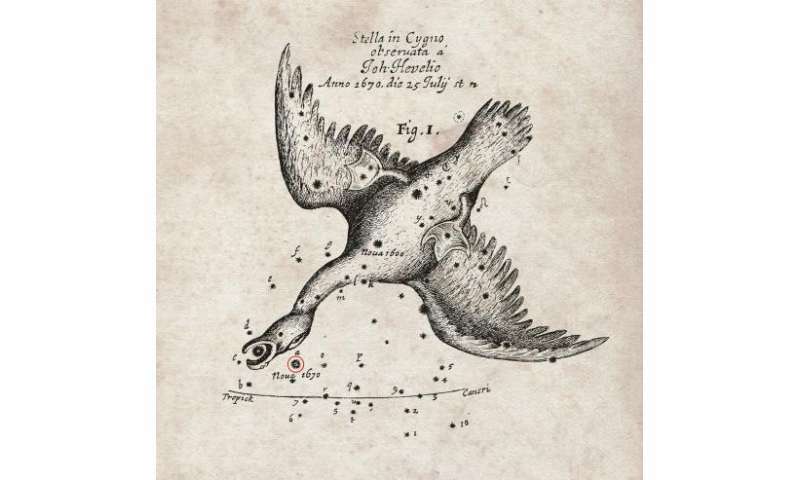 Hevelius described it as nova sub capite Cygni—a new star below the head of the Swan—but astronomers now know it by the name Nova Vulpeculae 1670. Historical accounts of novae are rare and of great interest to modern astronomers. Nova Vul 1670 is claimed to be both the oldest recorded nova and the faintest nova when later recovered. The lead author of the new study, Tomasz Kaminski (ESO and the Max Planck Institute for Radio Astronomy, Bonn, Germany) explains: "For many years this object was thought to be a nova, but the more it was studied the less it looked like an ordinary nova—or indeed any other kind of exploding star." When it first appeared, Nova Vul 1670 was easily visible with the naked eye and varied in brightness over the course of two years. It then disappeared and reappeared twice before vanishing for good. Although well documented for its time, the intrepid astronomers of the day lacked the equipment needed to solve the riddle of the apparent nova's peculiar performance. During the twentieth century, astronomers came to understand that most novae could be explained by the runaway explosive behaviour of close binary stars. But Nova Vul 1670 did not fit this model well at all and remained a mystery. Even with ever-increasing telescopic power, the event was believed for a long time to have left no trace, and it was not until the 1980s that a team of astronomers detected a faint nebula surrounding the suspected location of what was left of the star. While these observations offered a tantalising link to the sighting of 1670, they failed to shed any new light on the true nature of the event witnessed over the skies of Europe over three hundred years ago. Tomasz Kaminski continues the story: "We have now probed the area with submillimetre and radio wavelengths. We have found that the surroundings of the remnant are bathed in a cool gas rich in molecules, with a very unusual chemical composition." As well as APEX, the team also used the Submillimeter Array (SMA) and the Effelsberg radio telescope to discover the chemical composition and measure the ratios of different isotopes in the gas. Together, this created an extremely detailed account of the makeup of the area, which allowed an evaluation of where this material might have come from. What the team discovered was that the mass of the cool material was too great to be the product of a nova explosion, and in addition the isotope ratios the team measured around Nova Vul 1670 were different to those expected from a nova. But if it wasn't a nova, then what was it? The answer is a spectacular collision between two stars, more brilliant than a nova, but less so than a supernova, which produces something called a red transient. These are a very rare events in which stars explode due to a merger with another star, spewing material from the stellar interiors into space, eventually leaving behind only a faint remnant embedded in a cool environment, rich in molecules and dust. This newly recognised class of eruptive stars fits the profile of Nova Vul 1670 almost exactly. Co-author Karl Menten (Max Planck Institute for Radio Astronomy, Bonn, Germany) concludes: "This kind of discovery is the most fun: something that is completely unexpected!" "This kind of discovery is the most fun: something that is completely unexpected!" ..not so much for anybody living on a world in the target sun's Goldilocks zone. Insensitive remark.